Poop-power is not a new phenomenon, as methane-powered generators have existed for a while, and even larger scale developments have used poo-power as a way to meet energy needs. But powering a state with poo? This is exactly what Californian utility PG&E has just started to do, by creating natural gas from a vat of liquid-cow poo, in what is probably the smelliest (but smartest) way ever to produce any form of renewable energy. The CA Poo Power project is located in the Vintage Dairy Farm in Riverdale, CA and is the brainchild of David Albers, head of BioEnergy Solutions, who we previously featured in his attempts to turn poop into green. 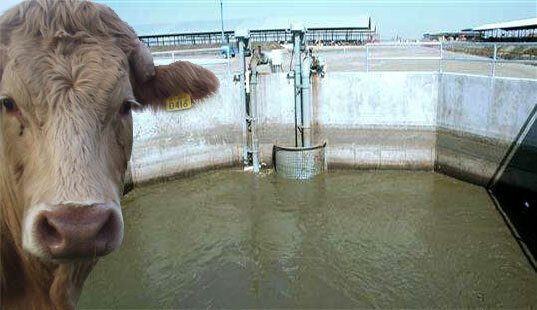 The project aims to turn the effluent of 5000 cows, effectively a 33 feet deep, 5 football field-sized vat, into natural gas. The lagoon is naturally covered to prevent the manure from escaping, and lined in plastic to stop the manure from seeping to the ground water. At the moment, this rather huge installation is able to power approximately 1,200 house per day. Not a large number, but then, you if you consider that there are 2,000,000 cows in California alone, you can certainly start smelling the possibilities. There is nothing like the truly renewable source of cow manure to power local facilities. I think that methane digester sales will boom but maybe not in California because of the heavy restrictions on permitting that exist. I love this! This is the coolest form of alternative energy because these amazing animals already give us so much now they are giving as power!!!!!!!!!! Yes, having a lot of cows in one area can cause a bad smell. That is another advantage to a methane digester system. If the waste is being placed in a digester regularly, it isn't building up to the levels you speak of. 5 cows wouldn't produce enough waste to cause the smells you speak of if you were keeping the digestor fed. There is smell involved with any animal waste product. The reason it gest so bad is most of these operations either pile up the waste for drying or composting. That is a LOT of waste to offgas. Placed in a digestor you solve a lot of the problem. Wait! I don't want to smell the 5 cows needed to generate methane for my house. Multiply by thousands of houses. Did anyone ever drive by a dairy? Yuk! In 1977, I was part of an international team that designed a prototype commercial greenhouse that as part of its system uses manure to generate electricity. With just an 8% increase in initial cost, these greenhouses which are located in the northernmost islands in the British Empire operate year 'round without any connections to a utility system. Their payback was almost instantaneous and today, it is the standard in the Shetland Islands. For those who are concerned, the animals are allowed to move freely in the fields. Since then, we have designed/patented an inexpensive method to generate multi-times the energy per pound of poop, including human, than the out-of-date method described above and little, if any of the gases are released into the atmosphere. Once we receive R&D funding, we will proceed to bring it to market. Beyond this great article, am I the only one that thinks we should bring back horses as a viable transportation option since we're depleting all of our fossil fuels? Anyway, global warming or not, I'm all for more efficient use of our resources and anything with a cleaner process. Personally I think it's all cyclical but, as I said, we're always better off cleaning up our crap and not wasting mother nature. Toilet paper is a great example. Did you know there was a cotton based on on the market? PurelyCotton.com - there's an ecom site listed in this article. It's made from cotton linters - which is a by-product from the harvest. Top 10 Awesome Websites That Sell Cool Products You Probably Have Never Visited But Need To. http://www.comember.net/blogs/firepixel/ Check it out. CO2 is released when burning methane produced in digestors. At least it will not be CO2 released from burning fossil fuels. Burning the methane will not add to the overall CO2 levels in the atmosphere since the CO2 released came from the materials that make up the manure. What do they call that? carbon neutral i think was the term. And as stated earlier, processing the manure this way will keep a lot of methane out of the atmosphere which is a LOT worse. Somebody wasn't impressed with the project due to the bad proctices of the cattle industry. True, the cattle industry does need to change in a lot of ways. The way I'm looking at is, the manure is there whether it's used for this purpose or not. At least it can help to offset the use of coal and other fossil fuels a bit. Cattle are best raised on grasses and hay. Feeding cattle grain actually has a very negative effect on their health and happiness. Sure it packs the weight on quickly as well as increasing the marbling of the meat. It's just not a good way to raise cattle. Methane digestors can run with just about any material that biodegrades. They can use, wood chips, grass clippings, leaves, any sort of animal and human waste. Methane digestors are actually simple to build and there is much info available on the net to do so. The resulting gas can be used to generate electricity, heat water or homes, cooking, run vehicles, etc. Natual Gas is mostly methane. The leftover material that comes out the other end of a digestor is a 99.99% clean and natural fertilizer. The nitrogen content is higher than if straight manure were used. And you don't have the potential for spreading bacteria to your gardens that you would with using manure for fertilizer. As long as the digestor is designed so that manure is held within the device for 90 days or longer, human waste comes out safe as well. If you are still concerned about that, you could compost the material just to be sure. To a lot of people, the fertilizer coming from a digestor is more valuable than the methane produced. I'm happy with any attempts I see to take what was once a waste product and make it useful. Many small steps like these will be required to make ourselves more self sufficient. For those concerned about the CO2 gas created by burning methane, let's put this into perspective. "Burning methane does release CO2, but mole for mole CO2 is much less of a greenhouse gas then CH4" (Methane). I found that quote here: www.worldchanging.com/archives/001625.html So, CA is actually helping our global warming problem with this project :-) Way to go California!! In response to the comment left by James, I too am left thinking that the whole concept outlined above is side stepping the important issue of how wasteful beef production is to begin with. Since the only way to harness methane efficiently is through intensive agricultural practice/malpractice then why not abandon this idea and focus instead on capturing the effluent from another (entirely willing) captive species.....us. Thom and Brian Lang. Human waste is used to produce power. I went on a tour of a Sewage treatment plant (Northern Beaches Sewage treatment plant, Sydney) today and found out. Toilet paper eventually breaks down along with the feces to form sludge. The problem with Human waste is that people also flush down Condoms, Tampons, plastic bags, Cotton Buds, and other material that is not Biodegradable and this is seperated in a machine called the screener. The waste collected from the screener is carted off to the landfill. However, the sludge is then put into Giant Vats where anarobic bacteria(through their metabolism) break down the sludge and forms the methane. this methane is then collected and used to generate power for the Sewage treatment plant. The people at the plant found that the Vats was producing more energy than required and is now pumping it back into the grid. In reference to my last post, I am still curious as to how they collect the manure, since the most effective way, and presumably cost efficient too, would be to keep the animals indoors permanently but this is obviously at odds with bucolic images posted. Wow, I'm impressed. According to the story it only takes five cows to power a house. Is it really that efficient? I find it hard to believe. If you could turn all the cows' food to energy, you should get enough power for your home, just from some grass. Anyway, I think this is a nice solution for the cow-poo problem. But, you can't collect it when the cows are running around in fields, and imprison them all day isn't very humane, now is it. But, anyway, it IS possible to get energy out of people-poo, we do it here on a small pilot- scale with some promising results. Larger projecs are in the making. Well, this should balance out the cow farts. @Thom: Human effluent has lots of other junk in it. Toilet paper being one of the largest components. @jamie: They're simply dropping the poo into a large tank and waiting for it to decompose. One of the products of decomposition is methane. Then they simply collect it, compress it and add it to the natural gas grid. @andy banx: I agree. Carbon Dioxide emissions need to be reduced as much as possible, as fast as possible. That, and we need to build carbon dioxide scrubbers for the atmosphere. Unfortunately, no one has built efficient devices to do so yet. Can someone tell me why this can't be done with human effluent? We already collect it and spend lots of money and energy to alter it so that it can be dumped into the ocean, as is the case in Vancouver. And we have more people in cities than cows. How much energy does it take to turn the poo into power?